‘Pain’ instigated my journey towards Barefoot and Efficient Running. It turns out that Necessity is the Mother of both Invention, and ‘Taking Matters into your Own Hands’. Shin Splints & Sciatica. The 3-S’s. The bane of my life because, either together or alone, they made a misery of the one constant that had kept me sane since I was at grammar school – running. I ran as soon as I was ‘old enough’. I held the record for the mile walk at junior school, because we weren’t allowed to run it – we were ‘too young’. I ran the inaugural Stratford-upon-Avon Half Marathon aged 17 … with 2 months to go to my 18th birthday, they wouldn’t allow me to run the whole distance. With knock-knees and gym knickers, I finish, telling the announcer off because he’d got my name wrong. Always was a stroppy Yorkshire girl! So exercises, uncomfortable insoles that I was to ‘break my feet into’, picking up pencils with toes, sitting cross-legged on the floor, strange shaped pillows, special seats for the car, for the desk and for the treatment couch, ‘resting’ and not doing the very thing that I loved (what kind of a solution is that?!) … I tried them all. Some helped a little; some didn’t at all; the pain was always there – the only variance was the degree. Then, in 2002, a breakthrough. It started with the most unlikely predecessor to a barefoot shoe you could imagine – the original and enormous-soled MBT trainer – with the ground far, far away from the actual sole of my foot. But the ‘B’ stands for Barefoot, so perhaps it was a clairvoyant peep into the future? Whatever, after 21 years of constant sciatic feedback of the grumbling-through-to-yelling varieties … it went. Extraordinary. And yet, when you looked at the postural improvements both in muscle tone and body alignment, it should have been expected. All my lymphoedema patients were cajoled into wearing them, to optimise venous return and drag the lymph, willing or not, along. The successes were so many and varied, that having been on the first MBT training course in the UK – along with 2 osteopaths and a chiropractor – I opened the first MBT shop in the UK. Running in MBTs myself, and correcting peoples walking and running gaits in them, filled my life for quite a few years. There wasn’t much choice floating around the footwear industry, apart from some awful ‘looky-likey’ fakes. This was well over a decade ago, and everything else in the running shops had ever-growing heel cushions, springs, stability posts and so-called crash pads (if you’re wondering, that’s the name the industry gives the flared section of cushioning around the outside of the heel area. Interesting, eh?). Many runners ran with a walking gait pattern – heel to toe – because, with all that cushioning protecting them, they could. Couldn’t they? Well, for all sorts of reasons – which is another article I’d gladly write – no! 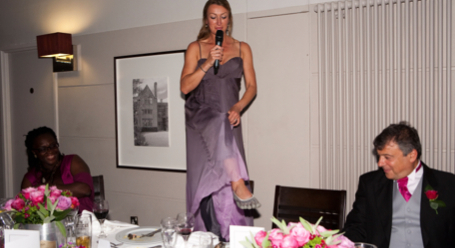 For a start, all that endless ‘toe-lifting’ to get the heel down ahead of the body was the source of my shin splints. Correcting my running technique to a midfoot/forefoot touchdown sorted that out almost obscenely quickly. And so I continued on my life’s journey, weaving a not-quite-straight-and-therefore-endlessly-engaging path to where I am now. And, having said goodbye to my 3-S’s, I made steady forward progress. 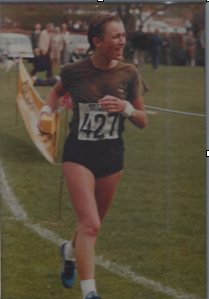 During my divorce, I was told my running symbolised ‘running away’ from my problems. What rubbish – invariably, within 30 seconds of starting a run, even if I wasn’t actively thinking about it, the solution to whatever was stressing me would appear. Running has been my saviour, my waistline friend, my health and my sanity. For me, running wasn’t an option, it was part of who I was, and helping others find solutions to get back to their running was crucial to me too. On the look-out for another way to do the same thing – help correct form and offer people choice – I found Newton shoes. A delightful tale of two philanthropists who wanted to use their fortune to help; to tell the world of an ‘alternative’ running shoe option; their non-cushioned, lower-heeled, forefoot-lugged, garish-coloured invention. Well, we flew on our first run. I PB’d my 5 mile loop by 8 minutes!! Whilst I knew the stats, that every 100 grams on your feet is 3% effort, and that MBTs were (very) heavy, they had been the only shoe I could find where runners were able, through the technology in the sole, to run with intrinsically better biomechanics. As one door closes, another opens … now we could both move in a more biomechanically-friendly way, AND not be weighed down by a couple of bags of sugar on each foot! The launch of Newtons in 2007/8 really marked the start of the energy towards natural running, minimal footwear and ‘barefooting’. I’d already met Matt Wallden, the forward-thinking, inspirational MD of Primal Lifestyle at the Back Show at Olympia. Wearing my much-loved toe socks, I’d been able to try on his Vibram Fivefingers (VFFs) with ease. There was something in the air. Pose Method and Chi running were being discussed, people were becoming more talkative on forums and experiences were being shared. I’d been barefoot and pregnant in East Africa, only to come home and be totally unable to fit into any ‘traditional’ shoe I owned. My childrens feet were perfect until they went to school in the UK and were moulded by Clarks and Start-Rite footwear. There was definitely something about shoes that didn’t seem to do much but cause grief. But not many were talking about it. We took the plunge. It’s so long ago now, it now feels like it happened overnight, but I’m sure it didn’t. 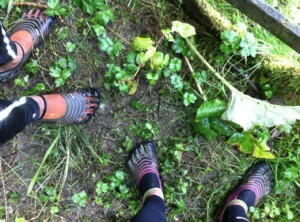 Wearing our first pair of VFF KSOs, we headed off for our first run. I still remember it. It was dark, it was somewhere off-road, we got lost in the moment and then actually got lost, we laughed, we felt the cool mud squeeze up and squelch between our toes, our arches were stabbed by cruel stones hidden along the path, we ran further than we’d planned, and even that was further than we ought … and all 3 of us probably had one of the best runs of our lives. We were hooked! Without a manual of ‘how-to’, we made lots of mistakes; which was all part of the journey, because now we’ve written the manual! 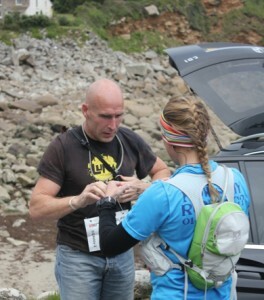 My own running, fixing people and run coaching was now almost exclusively done in VFFs. Choice was important to clients and customers, so the search for great footwear that allowed feet to be – well – feet, continued in earnest. I had a few other footwear options myself for wet and cold days, both of the minimal and ‘barefoot’ variety (Vivo Barefoot, inov-8 and Merrell Barefoot), but I spent more and more time either VFF’d or just bare foot. Running technique was honed unshod along the 5 mile country lane of the local ‘Pednor Loop’ – it’s amazing what you learn about the mechanics of the human frame in motion when you are totally connected with it. Returning from one such session, I was stopped by a lovely older lady with blue hair driving a blue Volvo estate. She wound the passenger window down and asked “Are you … alright?” Confirming that indeed I was, she hesitantly pointed to the apparent loss of my senses … “you seem to have – er – forgotten your shoes dear”. I still chuckle, bless her! I was asked ‘how far can you run in them?’ so often, I decided to go and find out. After an endlessly frustrating summer trying to sort out a hip flexor injury caused by riding too big a gear on too high a saddle (my bike handling skills leave much to be desired), I began my ultra distance running journey in the VFF Flow. I completed 2 of the 3 days of the Druid’s Challenge (29 & 27 miles respectively) in November 2009 … the hip flexor finally ‘went’ with 10 miles left of day 2. I dragged my right leg between my poles (now crutches) to reach the end, only to be casevac’d home, and scolded for my stubbornness. Blasted hip flexor is now my nemesis. With an uncompleted multi-stage ultra behind me, I overheard someone say “she couldn’t do it”. “Couldn’t do what?” I demanded. “Ironman”, was the answer. So I signed up for it. I’m not from Yorkshire for nothing. During training, I fell off my heavy winter bike by losing the back wheel descending a muddy country lane, and slightly broke my ankle – I say slightly because it wasn’t until the black bruising subsided from my hip and thigh that I even noticed my ankle was crippling me. The X-ray confirmed the break but by that time I’d been hobbling for a couple of weeks, so a cast seemed overkill. 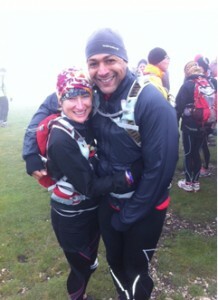 Good decision – 9 weeks later I ran the Berkhamsted Half Marathon. Not long after that, I fell off my brand new carbon race bike. This time I was standing still, telling a story. By getting over-excited, I over-balanced and keeled over to the side my foot was still clipped in. Desperate not to damage my brand new race bike and realising I was going down, whether I liked it or not, I lifted my incredibly light bike out of the way – saving it. Oh, how clever, balanced riders chortle when they hear this! I saved my beautiful bike and broke 2 ribs, with only 3 months left before Ironman. There’s nothing like an injury to focus the mind on perfect running technique. 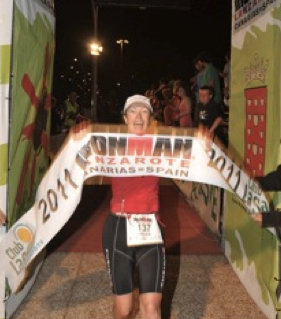 2.4 miles of swimming, 112 miles of cycling and 26.2 miles of running in Austria later, I became the world’s first barefoot Iron(wo)man. The World’s First Barefoot Iron(wo)man! Now I’d done it, I was satisfied. Wearing my medal in the shop (sad Yorkshire girl) I was asked “which one?” “Austria” was my reply. My next adventure began with the words that followed, “Ah yes, the ‘soft’ Ironman”. Training began almost immediately, followed by a bike crash 6 weeks later, where another lack of handling skills, plus a bit of bad luck, saw me wrapping myself around a concrete post. A gradual loss of power and feeling to my left arm, preceded the thunderbolt that I ought to seek help … when my eldest 6’ 2” son came home from university and I couldn’t reach up to give him a hug. In December 2010 the wonderful Mr Sabin kindly gave me back full use of my left arm by performing a double discectomy with spinal fusion levels C5-C7. Within 24 hours, all symptoms had completely disappeared. 5 days later, in the snow up at Coombe’s Hill, I ran 50 yards because, with skilled, non-impactful, barefoot running skills … I could. Frustratingly, 8 weeks later, just as I was about to get back on my bike, the umbilical hernia – that had popped out simultaneously with the two discs – had to be repaired. Permission was granted to ‘start very gentle exercise’ at my 6 week check-up. I nodded obligingly, opting to omit the news that I’d just returned from a warm weather training camp, where (gently) cycling 112 miles had been our final day’s action! That training camp sticks in my memory for more reasons than ignoring recovery advice (based on what evidence? I’m not stupid, and I don’t like pain; if my body had wanted me to stop, I would have, but it was fine, so I carried on). 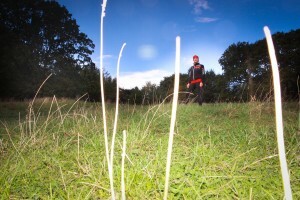 Despite my outward bravado, I had been really worried about the pending Ironman sea swim; a mindset not helped by getting bitten by a foot-sucking fish on a training session. 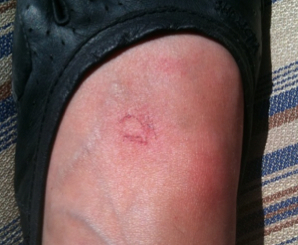 A friend ‘reframed’ the bite into a ‘kiss from the sea’ and the evidence is now my avatar on a number of forums. “Kiss from the Sea” aka my first fish-bite! 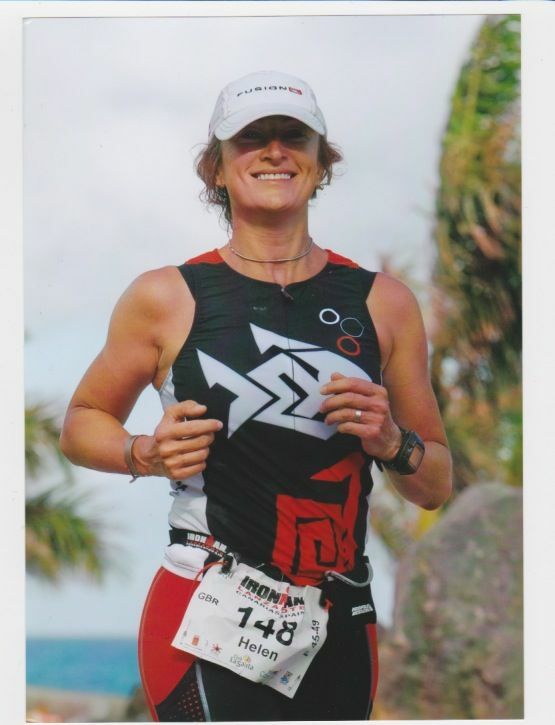 With the scar on my foot still visible, on 21st May 2011, 5 months after major neck surgery and 3 months after abdominal surgery, I completed – 40 minutes faster than my first ‘soft’ Ironman – Ironman Lanzarote … the hardest Ironman of them all. As far as I was concerned, as I grabbed the finish-line banner and wrestled it off the glamorous banner-holders, I’d won. I had been told I couldn’t – and shouldn’t. But a challenge isn’t a challenge if you know you can do it. In my heart of hearts, I knew that if I used my body as well as I possibly could, as well as it was designed to be used, then I ought to be able to do it. After all, a bone knits together in about 3 weeks – the knit is strong by 6 weeks – so I had time to heal, and to get strong, if I used my body with biomechanical kindness. This is what I passionately believe barefoot running to enable – fluid, flowing, comfortable, sustainable, efficient running with minimal injury risk – through biomechanically-friendly movement. So what does an opinionated Northerner wear on her feet when she gets married? Vibram Fivefingers. And what do Mr & Mrs Hall do on their honeymoon? Run round the vineyards of Languedoc in ‘his and hers’ VFFs, preparing to face the demons of her unfinished Druid’s Challenge … of course! And, at the 11th hour of the 11th day of the 11th month of the 11th year of this century, we set off – Mr Hall for his first 31 mile ultra distance run, and me (now Mrs Hall!) 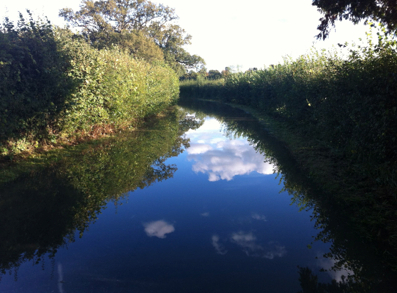 to complete the 3 day 84 mile Druid’s Challenge – because we could. Remembering the start still catches me at the back of my throat. I didn’t know I could do it, but I thought I could. So I tried. Not famous for paying attention, I got lost every day (‘just follow the acorn signs’ they said – how difficult can it be?) … but finally, I found the finish line. 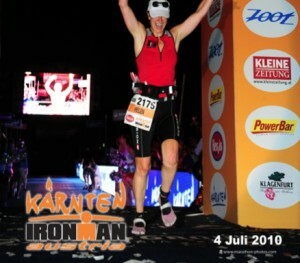 More emotional than the first Ironman; more emotional even than the 2nd Ironman. Completing Druid’s Challenge was utterly overwhelming. And now I could tell people that so far, the furthest I’d tested the concept of barefoot running, was 87 miles. Now Mr Hall, having supported me through two Ironmans, wanted to give it a go himself. Upping the anti, he opted for his first triathlon to be the hardest Ironman in the world, so back to Lanzarote we went. Having even more demons regarding the sea swim than me – being a non-swimmer – he moved mountains to achieve his goal. And being a big bloke, he needed to move as efficiently as possible, so naturally he ran the marathon like me, in ‘barefoot’ shoes. I ran in the VFF Seeya’s – gorgeously ultra-thin, super comfortable, and I discovered, without heat insulation. I ran faster than usual until I was able to slow up a bit when the sun went down. The ground was H-O-T!! 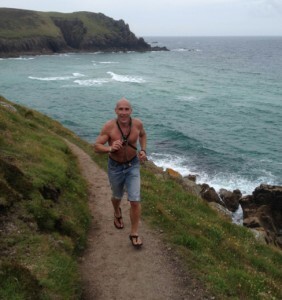 Turns out, by using the muscle memory of skilled running – with as little impact as possible – running 12 miles along the beautiful, if rather lumpy, Cornish coastline with a prolapsed disc is do-able without pain. Not at speed, but do-able. 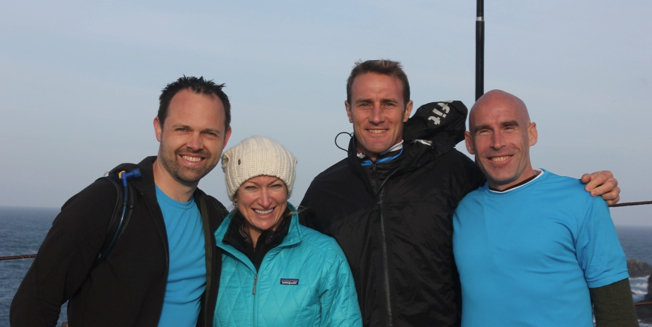 The Adventures of Team Shambolic – featuring Matt Wallden, Tim Bishop, me and the world’s barefoot best-friend ‘Barefoot Ted’ – is it’s own story. Suffice to say we had a blast, raising eyebrows along the 44 mile trail with our ‘non-standard’ attire (never mind our footwear choice – Barefoot Ted ran in a jumper and cut-off jeans with a leather sack for a hydration pack!). My Efficient Running Barefoot Journey continues apace, immersing me in exciting projects and more adventures. 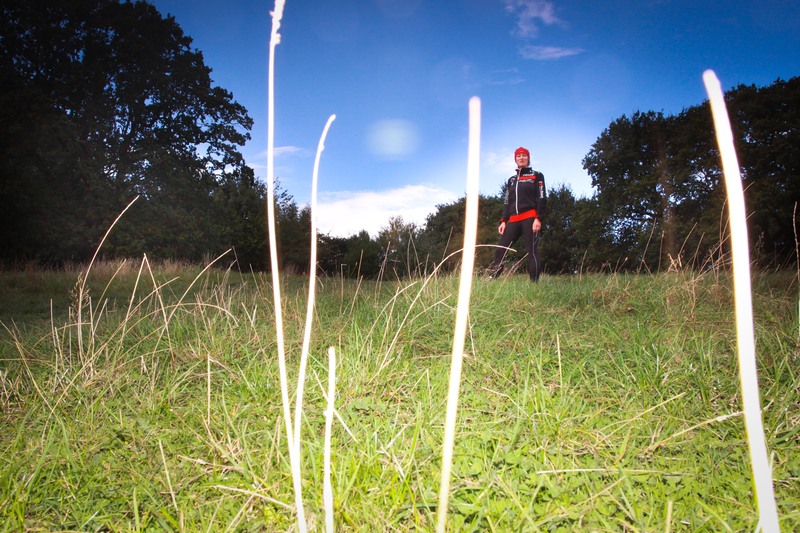 The most experienced training provider in the UK, YMCAfit, approached me to write a manual to teach their instructors how to coach Barefoot Running, bringing the skills – and the joy – to more. The innovative British footwear company, inov-8, brought me in to coach the finalists of their “8 week to be a Natural” runner competition; accompanying those 8 runners – from a widely ranging ‘start point’ – on their minimal/barefoot journeys was an honour and a real pleasure. It’s possible that we might also be known for not-very-subtly encouraging runners to swap out their clod-hopping trainers for … well … less! Matt Wallden, of Primal Lifestyle and Team Shambolic fame, and I have started bringing the science and the practical together with runIQ workshops for the ‘curious-to-know-more-but-you-need-to-show-me-the-evidence’ as well as the ‘I-want-to-start-but-I-don’t-know-how’ runners. It’s nerve-wracking being in front of larger audiences, but the positive feedback is rewarding and encourages me to be more confident, standing my ground against the endless backdrop of negativity surrounding the heel-strike/midfoot debate and its sister, the shod/unshod debate. As Steven Lord, the first barefoot Ironman tweeted it, “Describing running the way nature intended as a ‘fad’ seems bizarre. Next walking will be a fad, or sleeping”. Intertwining and underpinning all this work, is my joint project with my running protege and musical genius, Kirsty Wright (aka Hawkshaw). 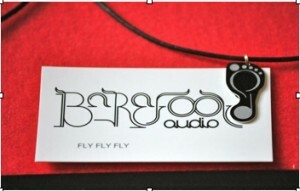 Barefoot Audio is the result of a coincidental meeting of a musician (Kirsty) and a barefoot running coach (me). 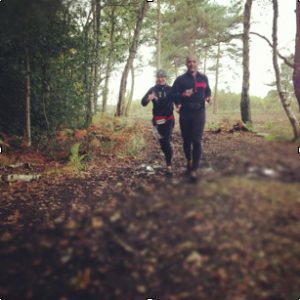 I was endlessly frustrated by the lack of appropriate music with a fast enough beat to help my runners improve their running cadence and technique; and Kirsty was in search of a convenient way to improve her health and fitness safely and comfortably following the birth of her third child. We combined beautiful music at just the right beat, with step-by-step progressive coaching, to create a tool we are immensely proud of, to coach the feel for skilled, efficient running. In running, I found pleasure, release, fitness, independence and freedom. The pain of the 3-S’s of shin splints and sciatica took that all away. Developing my running form with ‘technical’ footwear and then my running strength with the emerging ‘barefoot’ footwear gave all those positive emotions back to me, and then some. From gym knickers and Northern roots … to the co-founder of the world’s first minimalist running music label. Whatever is next – bring it on!